﻿﻿﻿﻿At first, Forrest Mims III paid little attention to the odd “cigars” that emerged beneath cedar elms on his land north of Seguin. After his wife observed a puff of smoke shoot up from the ground, Mims, an amateur scientist, investigated. Closer examination revealed the source to be a devil’s cigar (Chorioactis geaster), also called the Texas star fungus. In the decade since, Mims continues to collect data about the rare species, which occurs only in several North and Central Texas counties and Kyushu, Japan. 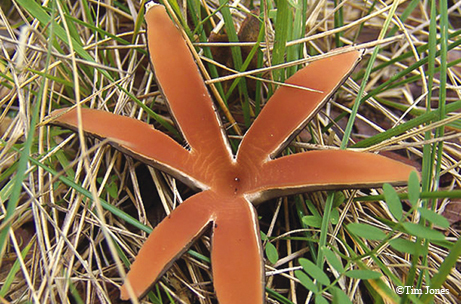 Texas star fungi appear in winter, typically near cedar elms and oaks. First, a tapered capsule, dark brown and measuring approximately 4 inches long, rises from the ground. After rains, the capsule splits open and unfurls into a tawny star that hisses and puffs smoke. In 1997, fans of the species lobbied the state Legislature to designate the Texas star fungus as the official state fungus of Texas. However, the proposed legislation, which got stalled in a House committee, was never signed into law.